Hamburger wrote: Try set MINCOMMAND 1008. I think that is used for initializing? Thank you! That did the trick yes. where are BEMF caps on HobbyKing Blue Series 12A ESC. Has aybody tried new Simonk fw (30 Sep) on F-30A esc? Any performance gains: heat, longer flight time...etc? In the wii-esc source code, does anyone know where the FET on/off methods ( AnFETOff(), ApFETOff() , etc..) are located? I'm trying to compile it myself but all of those functions seem to be missing. In src/hal/bs_nfet.h, for example, included by core.h. See makefile.avr. Now I have set MINCOMMAND to 1000 in config.h. I have simonk esc's. When I plug the battery in, everytime I should hear 4 beeps. 3 for 3S lipo and one for inicialisation. Sometimes I hear just 3 beeps but quad works normaly. Will bo something wrong if I set MINCOMMAND to 950 or leave at 1000? I use 950 for F-30 reflashed with simonk fw, never have any problem. 1) Added possibility to adjust end-points using stick programming procedure (full throttle, power-up, wait for 2 beeps, throttle down, wait for long beep). 2) Tweaked pwm on/off procedures for complimentary pwm, to archive constant dead-time. this can be disabled at compile time, I suppose? I like wii-esc version 1 beyond other aspects because it is _not_ configurable at run time; so whatever stupid happened on the input side (like MultiWii fc outputs), that could not de-calibrate the ESC; effect: the ESC always worked with the same compile time settings, period. It can be disabled in EEPROM config. Basically all shipped configs, except "default" have this disabled. Does the WiiESC FW also have a bootloader or will it "kill" the bootloader I have in my ESC from the SimonK FW? Did somobody try to use: https://github.com/c---/ArduinoUSBLinker instead f using the Turnigy USB linker with the kkMulticopter Flash Tool? The question is which is the part that dyes that way? Is it user replacable? I'm talking about old HK-12A BlueSeries (http://www.hobbyking.com/hobbyking/stor ... oller.html) and in accordance to (https://docs.google.com/spreadsheet/ccc ... ZRlE#gid=0) it should be all N.
Usually P-FETs ;( You can buy them on Ebay, but usually it is faster and cheaper to replace whole board. @Quad FRITZ: You also need to remove BEMF filtering caps. 3. Unsuccessfully using AVRootloader to write eeprom settings, ESC/rootloader does not responds anymore! If I invert steps 2 and 3 it works, but only one time. IMHO: it looks like actual flash for ESC overwrites part of rootloader!? 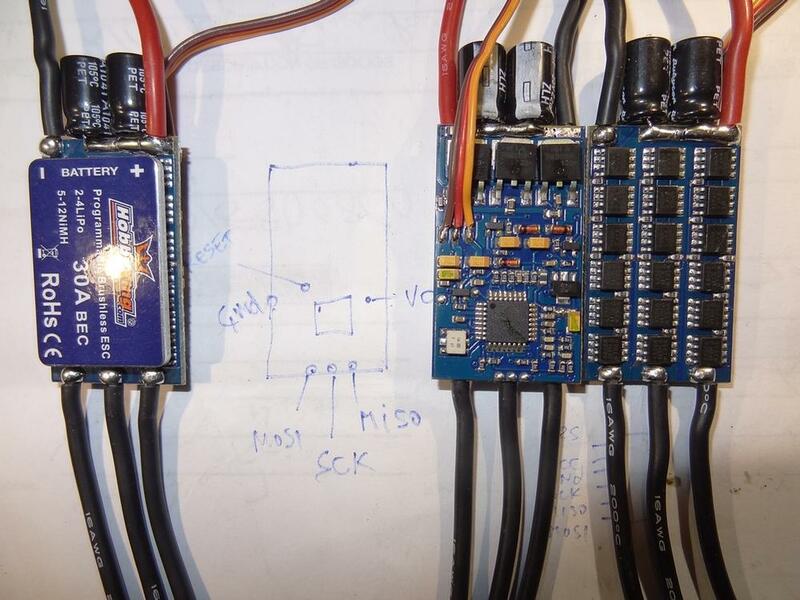 The behavior is same with flash tool 0.4 and 0.5 and with ESC flash from r433 and current. Flashing everithing with plain USBasp works. I had impression that when using WII-ESC-Flash tool it takes care of fuse (and other) bits. I guess/hope/persume that lockbits can be inverted (unlike reset disable)?! And some tips on how to find them in future as I have another ESC coming. I've got same problem with identifying BEMF capacitors in RCTimer 20A. I've also read that they can be changed with 40pF ones. Is it true ? I think I worked it out. How could be set fusebits for ESC. I think it will be good time to clearly listed fusebits to set up. The rest is depend on schematic and component's used by manufacturer, so it is better to not touch them. So, I always read existing fuses, check them, and write-back. for all who flash esc, build a stand like this. for my helicopters I use Multiwii and F-40A escs on 3S. So it is time to reflash with wii-esc firmware, but I cannot modify the hardware, so removing smd caps is not an option. As a consequence I will need to use the former version 1 of wii-esc. The ESC is all n-fet, so I think I should use Mystery20A_nFET with pwm_arduino_250', right? when looking at the simonk firmwares spreadsheet it says to use simonk: bs.hex for the f40a all n-fet. But to my understanding (and from what I can see for other esc brands) bs.hex is suited for p/n-fet esc? 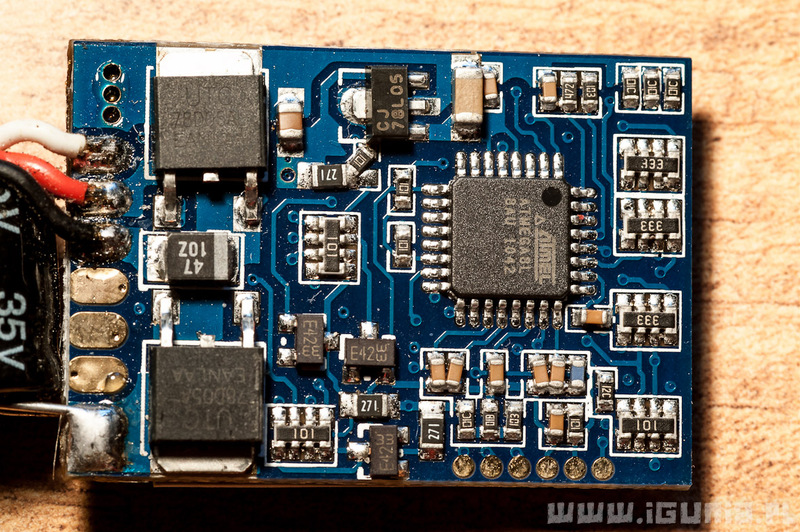 For smaller sizes of the F-xxA series the bs_nfet.hex is choosen as one would expect? As I currently do not have a spare esc to experiment I would prefer to confirm this before bricking the esc. @Hamburger: Not sure about your specific ESC but Turnigy TY-P1 are all N-fets and are using bs.hex. I know since I'm using it! ok; thanks for verifying. So bs.hex is not strictly tied to p/n-fet. Which old wii-esc variant would you use for that esc then? But of course it was/is TY-P1. hello! Just out of interest, what do you like better about it? so removing smd caps is not an option. Can you identify the caps in question just by looking at that? (All Ihave is a multimeter, if that was neccessary). With the version 2 line of wii-esc, you use same names as database&simonk for output, so I would use bs.hex. a quicky.. seems the latest fw has the "complimentary pwm"
is that the new "stick calibration" firmware? You can disable stick calibration in EEPROM block. I would like to confirm that the BEMF capacitors for HobbyKing F-20/30 are the three capacitors in line, next to the pads used for flashing. I think I found that in the rcdesign.ru forum, but can't find it again. any suggestion that might help to get rid of the lag? BTW: It looks long only with 50hz receiver, with real FC, the delay 10x times shorter. Last edited by ziss_dm on Thu Nov 29, 2012 4:36 am, edited 2 times in total. anyway to remove that feature? If we are talking about MultiWii, the throttle never drops below MIN_THROTTLE, which should be configured to get stable Idle RPM. Attempt to stop motors in-flight would lead to crash in 90% of cases, with any ESC or ESC FW. This is because start of sensorles brushless motor is lenghthy trial-error process, which could take a couple of seconds. just want to smooth that lag out towards more linear... and instant..
1) RX - 50hz, FC - 500hz with FC connected delay 10x shoter, which is almost unnoticable. 2) Most FC's has "armed" state. After FC is armed motors start spinning and never stops until you "disarm". I'll try to use 3s batt... the vid is with 2s battery ... But compare to stock.. it is still a bit slower.. Try with FC, instead of RX. there is lag too.. but not as significant..
seems improved..(tho still a bit laggy). are the red-circled right ones? Last edited by jy0933 on Fri Nov 30, 2012 12:14 am, edited 3 times in total.